The Organization for Security and Co-operation in Europe (OSCE) Special Monitoring Mission (SMM) to Ukraine continues to face increased security risks as a result of targeted disinformation campaigns. Harassment and security impediments inhibit the mission’s ability to provide crucial verified reports on the conflict in eastern Ukraine. As @DFRLab previously reported, anti-OSCE violence and disinformation have been seen since the launch of the mission. Security assurances for the SMM are required by multiple international agreements, but between mines and unexploded ordinances (UXO), physical aggression, and harassment, the SMM is unable to function at its full capacity. During the question and answer portion of the same briefing, Russell “Texas” Bentley, a foreign fighter for the “DNR” and a self-proclaimed media and “information warfare” producer, asked follow-up questions about the June 20 incident. In the live video, Bentley cast doubt on the incident and asked for evidence to prove the “accusation.” Bentley’s line of questioning, as shown during the briefing and on his website, embodied the Russian-led separatist disinformation campaign targeting the OSCE. A few days later, on June 23, another SMM patrol was caught in crossfire near government-controlled Zolote-4, near the Zolote disengagement area (DA) in Luhansk Oblast. The patrol narrowly escaped unscathed, recording high-intensity small arms fire, 82mm mortar fire, and automatic grenade launcher (AGS) fire. A third incident occurred on June 29 when two armed men with assault rifles from the so-called “Luhansk People’s Republic” (“LNR”) threatened to shoot SMM members in Vesela Hora, Luhansk Oblast. The armed men alleged that SMM members congratulated residents of Vesela Hora on Ukraine’s Constitution Day — celebrated on June 28 — and stated they would shoot SMM members if the message was repeated. After the SMM issued the daily report recording this incident, the “LNR Information Center” published an article, which accused SMM monitors of aggressively congratulating people on Constitution Day. The “LNR Information Center” requested that OSCE leadership conduct an official investigation into the incident; a spokesperson from the “Ministry of Defense of the LNR” cited concerns about the principles of the SMM. Casting doubt on the SMM’s ability to execute its mandate endangers the unarmed civilian monitoring mission. The OSCE SMM’s verified reporting is an essential source of information on the conflict in Ukraine. Both the Russian-backed separatists and Ukraine provide one-sided reports on the conflict, though we see far more instances of outright lies from separatist news sources, such as far-fetched stories of an “Islamic battalion” assisting the Ukrainian government in Mariupol. However, it is important to monitor the output of both sides, especially as it relates to the reporting of the neutral OSCE SMM to Ukraine. On June 30, the Ukrainian Anti-Terrorist Operation (ATO) Press Center falsely reported that militants from the “LNR” shelled the OSCE SMM’s newly opened forward patrol base in Popasna, Luhansk Oblast, the night of June 29 with weapons banned by the Minsk Agreements. The OSCE SMM promptly clarified the statement, issuing a “fact check” noting considerable shelling in the area the night of June 29, but not directly on the base. All of the mission’s staff were safe and no damage had been sustained. 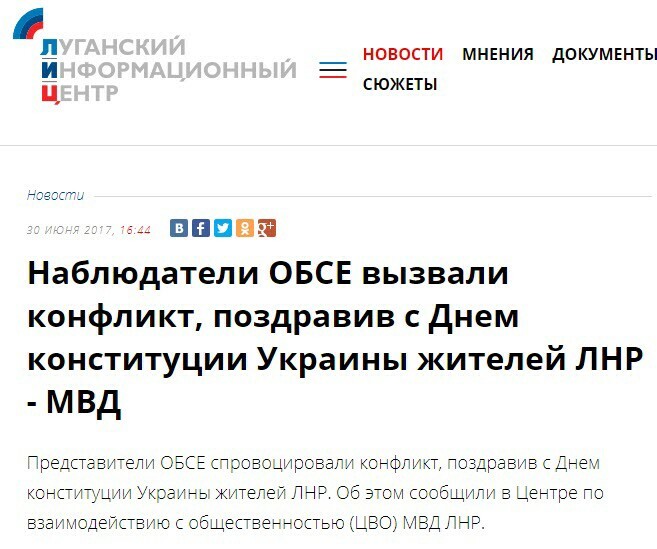 Fake news regarding shelling of the OSCE SMM’s forward patrol base in Popasna published by the Ukrainian ATO Press Center. Lack of accountability and action to address harassment and security restrictions despite international agreements led to the death of one SMM monitor, an incident that still substantially affects the SMM’s reporting abilities. Without necessary security assurances, the SMM is unable to facilitate repairs to critical infrastructure, provide humanitarian aid, establish ceasefires, or be the sole provider of crucial verified facts from the conflict in eastern Ukraine. For more in-depth analysis from our regional experts, follow the Atlantic Council’s Dinu Patriciu Eurasia Center. Or subscribe to UkraineAlert.